It’s currently unclear why daytime sleepiness would be correlated with the deposition of beta-amyloid protein. 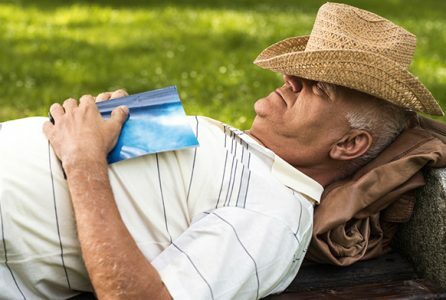 The finding adds to a growing body of evidence that poor quality sleep could encourage this form of dementia to develop, suggesting that getting adequate nighttime sleep could be a way to help prevent Alzheimer’s disease. “Factors like diet, exercise and cognitive activity have been widely recognized as important potential targets for Alzheimer’s disease prevention, but sleep hasn’t quite risen to that status — although that may well be changing,” said Adam P. Spira, PhD, associate professor in the Department of Mental Health at the Johns Hopkins Bloomberg School of Public Health. Spira led the study with collaborators from the National Institute on Aging (NIA), the Bloomberg School and Johns Hopkins Medicine. Researchers have long known that sleep disturbances are common in patients diagnosed with Alzheimer’s disease — caregiver stress from being up with patients at night is a leading reason for Alzheimer’s disease patients to be placed in long-term care, Spira said. Growing beta-amyloid plaques and related brain changes are thought to negatively affect sleep. But this new study adds to growing evidence that poor sleep might actually contribute to Alzheimer’s disease development, Spira said. This suggests that sleep quality could be a risk factor that’s modifiable by targeting disorders that affect sleep, such as obstructive sleep apnea and insomnia, as well as social- and individual-level factors, such as sleep loss due to work or binge-watching TV shows.